In previous videos, I've made reference to a template dot php file. The template dot php file in general is the one place where you'll find php logic inside of a theme. Anytime you feel tempted to put some logic inside of a template file, for example, usually the template dot php file is a better place for that. By separating out all of that logic into the template dot php file, you allow themers to be able to focus on just working with the template files and not having to work with that PHP logic. In a template file, you can find a variety of elements and I just wanted to go over what you might find in there briefly. First of all, you'll find preprocessing functions and we'll talk about preprocessing functions more extensively later, but what they basically allow you to do is to adjust the output of certain items in a template file before they get rendered. So if you want to adjust the structure of the submitted by content that's underneath a title, for example, you can change that in a preprocessing function and it's better to do so there than in the template dot php file. You'll also find process functions or processing functions which are the same as preprocessing functions except that they are simply triggered after all of the preprocessing functions have run already. Next, you'll find the theme function overrides. So any theme functions that begin with theme underscore and then something after that can be overridden on a theme layer. Now, if you've been watching the videos on module building, you know that they can be overridden in modules as well, but the theme layer works the same way and whether you decide to override it on the module level or the theme level depends on who is going to be modifying them later. You'll also find some utility functions that don't quite fall into any of these categories but are used by preprocessing functions or theme functions inside of that template dot php file, and sometimes it makes sense to bundle a bunch of logic up into a separate function that's going to be reused, for example. 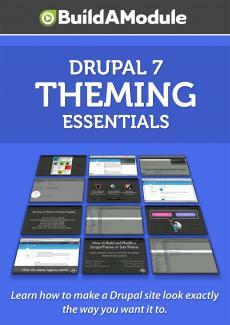 So go ahead and navigate to your themes directory that's right here in your base Drupal directory. Let's go ahead and open up Bartik first and inside of this directory go ahead and open up the template dot php file. All right. We're just going to take a brief look down this file and look at the functions that are being called and what their role is. Sometimes template dot php files can be a little daunting. As we scroll through here you see there's a lot of code, there's a lot of comments, and it looks pretty dense. So one way to kind of break it down is by looking at the list of function names that are inside of this template dot php file and beginning from there, getting an outline of it. And this can also give you a feel for the types of things that this template. php file is doing. In Komodo, the development environment that I use here, there's this link at the very bottom of the page with this green dot and if you click it you can see a list of the functions that are being defined inside of this page. So you see this is pretty finite. There's only about 10 functions here and we can get a feel by looking at the name of the function, the structure of it, what they're doing. So this one has the word preprocess in it which means that it's a preprocess function. We have process, process, preprocess, process, process, preprocess, preprocess, and then only these last two here are ones that aren't preprocess or process functions. So these are our only wildcards.